Sitting at my new desk in the ITC office on this sunny Friday afternoon, I am taking a moment to think back over the past few months, in particular the last five weeks and four days in which I have been ITC’s new General Manager. For the past six years, I had been working at Greenwich & Lewisham Young People’s Theatre (GLYPT). As with so many of ITC companies, GLYPT are committed to creating high quality work and try not to let the continued reductions in funding, resources and staffing way too heavy on their shoulders. I know this is not an easy task. I have both felt, and seen the effects of being overworked and under pressure. Yet, I also identify with the strength and passion that is paramount within our memberships and how much can be achieved with very little. My hope is that my experience on the frontline will enable me to appreciate these difficulties and support you through them. Since starting on the 11th September, a number exciting things have happened here at ITC. Our Autumn Training Season began with Starting a Performing Arts Company and continues with 10 more courses over the next two months. I sat in on Starting a Performing Arts Company and felt utterly inspired by the 22 participants who had travelled across the country to learn together. The room was full energy, ideas and questions, and whilst surrounded by people at the start this exciting journey I recall thinking, I want to help them do this all “correctly”. Thinking about this revelation now, it’s nice to know I am in the right job. ITC999 was held on Monday 9th October, an opportunity for non-members to access our services and get a feel of what being an ITC member is like. Charlotte, Jackie and Honest Kev (that nickname has stuck already!) took advice calls and were hardly off the phones all day. With questions about boards, theatre tax relief, contracts and opening new venues. The office was buzzing and many of the contacts that day have either become members already or have shown intention to do so soon. Last week Tuesday, I had my first ITC board meeting. As you will probably be aware, our board is made up of representatives from ITC companies who are voted in at our AGM. The atmosphere was warm, but more notably incredibly engaged like no other board I have witnessed. Discussions about communications, Ethical Manager Status and the approaching AGM (date TBC) were had, with the board speaking both on behalf of themselves and the ITC membership. And amongst those larger moments, my first few weeks have been a mix of welcoming new members (29 since I started! ); connecting with existing members, hubs and regional reps; and trying get out and about to see member’s work – please do tell me what you’re up to so I can try and come along! I feel strangely at home already. This is largely down to my colleagues who have all been wonderfully welcoming, but I think it is also due to the fact that I found a place in an organisation whose values match my own and are at the forefront of what they do. ITC’s strapline is Good Art Thrives on Good Management, needless to say all General Managers have this tattooed on our body on the first day in post. This sentence sums up ITC’s philosophy and it is so encouraging to see this work in practise, both here in the office and across the country. Despite the hardships the arts sector faces, your energy, enthusiasm and warmth combined with the shared belief in the power of the arts is more impressive than I imagined. The Independent Theatre Sector really are achieving remarkable things and I cannot wait to keep encountering these and, of course, support you along the way. 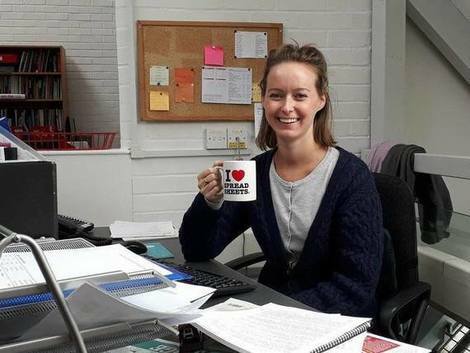 Zoe is now full time at ITC, please do get in touch via phone (020 7089 6821) or email (z.bateman@itc-arts.org) with any issues, for a chat or to tell her the exciting stuff you’re up to. ITC is the good program and related to the information technology. The online resume services take one month to complete every batch and students get certificates at the end of every batch. Very nice blog it is the amazing so save the all setting for the delete search history in bing on the browser easily this is the way for secure the browser setting for batter work thanks. Nice article, keep up the good work Zoe Bateman. You can Download and Play free games on your PC. Check out hunting games.